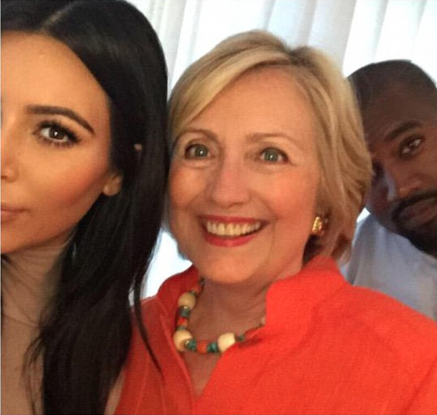 Kim Kardashian misspells president while endorsing Hillary Clinton's run for the White House. It seemed impossible someone would make a gaffe that would leave even Donald Trump red-faced on the day of the first Republican presidential nominee debate. But when Kim Kardashian appeared to endorse Hillary Clinton in a customary selfie, her tweet about the surprising meeting was somewhat garbled. Oh look! A hoe and a dyke. Damn, I can't take Hillary seriously now. Kim K. can't spell President and Dan Quayle can't spell potato. HRC has sank to an all time low! This bish is ignorant as hell. The only educated person in that family is Kourtney and Rob (he dropped out)...the rest of them nasty skanks have a PhD in Sucking, Screwing and Screwing whomever to stay on top!...SMDH! Clearly it was a typo (S and D are side by side on a keyboard), but I'm giving Hillary the side eye myself.